George, the boys and I spent Sunday afternoon walking through the streets of downtown Fredericksburg. It was such a beautiful day to casually stroll through town together. I forgot my camera though. Darnit, I keep doing that! We had lunch at one of our favorite spots in town. It's locally-owned and fresh, fresh, fresh. They bake their own bread for sandwiches and squeeze fresh lemons to make lemonade. Simple things that make all the difference in the world. We asked each other the same question we always ask when we go there. "Why isn't this place more crowded? Why would people rather go to a chain restaurant or grab fast food?" A mystery, indeed. Our downtown area is laced with antique shops and interesting little boutiques that beckon from the street. George waited so patiently (thank you, darling!) while I popped into a few of them. I found several old hats and trimmings for a song. Couldn't pass those up! I did pass up a lot of other things that I would have probably grabbed in the past. I'm trying to really be selective with my vintage purchases. Asking myself, Do I really love this? Do I have a place for it? Does it go with my aesthetic? Does anyone else find themselves doing this lately? How much stuff do we really need? Clearing out the clutter is a wonderful feeling, but it seems there's no point in doing it if we're just going to turn around and fill the house again. When is enough enough? This is the way I've been feeling lately. Being selective. Choosing only that which I truly believe is useful or beautiful. I'm going to bet that my husband doesn't think old hats are useful or beautiful, but I sure do! 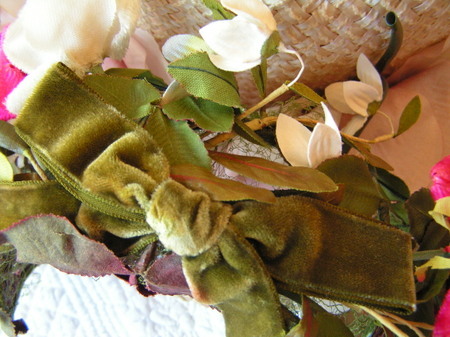 Since high school, millinery hats and trims have been one of my passions (purses and jewelry being the other two big ones). I always scoop them up when they're priced right. I can pass up a lot of cool old things, but millinery is not one of them! So, what about you? Are you feeling the need to be more selective lately? Do you tend to seek out specific vintage items when you're treasure hunting? What's your vintage passion? I'm an impulse buyer so it's hard for me to pass up much of anything:) But, if I have to be selective...I'll stick to white ironstone & blue glass mason jars. This is eXaCtLy where I find myself as well Andrea! My husband and I went through the house Memorial Day weekend filling a huge table with stuff I no long need or want. It was all stuff that is former decor. I love the freedom of having less, less to manage, take care of, store, etc... Unfortunately the mess is still sitting in the dinning room, but no more. Today is the day it all goes bye bye, part of the releasing process for this recovering "gatherer" of stuff. Letting go is so therapeutic! I made a comittment this summer to be a lot more picky. My husband and I hope to be buying a home within 5 years and every extra penny is going towards that so for now I am keeping myself out of the thrift stores and away from the paper to see what garage sales are going on. I get weak in the knees for vintage fabric so right now it is just best I just dont look and tempt myself. Yes, I am trying not to buy anything and everything I see anymore. I've been weeding out and trying to get rid of some clutter and I don't want to get more clutter....but there are the things I fall in love with and have a place for them so that of course is an exception. I love your hats. I am in the same place -- trying to clean out and declutter and really thinking before I buy. I am just beginning to discover and love the vintage look and bring it into my home. At this point I honestly don't even know where to begin. Any suggestions? I'm in a bit of a weird spot though because at the same time I'm trying to redecorate and go with a new feel I am also trying hard to spend a lot of money!! Thanks for the inpsiration as always!! Love the hats!! I agree - I've been trying to be more selective in many areas of my life lately. I just feel like I have way too much stuff...I absolutely love all the vintage items & find it incredibly hard to resist. 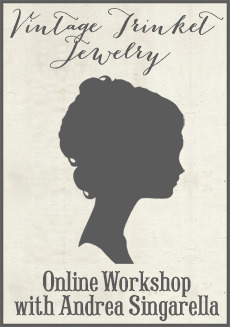 I see items & think, "...wow, this is such a great price (or free) & I could do this & that..." I already have so many gorgeous vintage crystal trinkets (that's my passion & weakness) that I use to make my jewelry. I'm trying to use what I have 1st... I find it very difficult to go to our local weekend flea market, and not buy something small. And since I have such a hard time saying no to myself, I have found myself just skipping the flea market more than I used to. About getting rid of things, in our area, we have something called Freecycle.org - I give away so much stuff there. Anyway, I love, love, love your hats, rose, ribbons, jewelry & just everything you make! You have so much talent!! My biggest problem is that I love it all! Dishes, linens, paper goods, fabrics, trim.... I am trying to narrow collections down and pick up the most quality of merchandise for the the best price. despite the fact that i have never met a vintage handbag that i didn't love... i have been trying to be much more of a collector than a hoarder - trying to curate rather than accumulate. trying to be good about buying everything! Yes, over the years I have become much more selective in the things I buy. My Halloween collection is all vintage. I use to buy everything, now I choose wisely. Glad you found some great stuff. Sounds like you had a great day! I think as we settle in to our creative selves we can become more selective. However, I do like having a wide array of materials at hand as I don't plan out anything prior to creating, its all very intuitive and in the moment. Yet, what I have been trying to do is to wait until I know I need a certain special something and then go about treasure hunting for it, instead of just scooping things up willy-nilly and hoping that one day they will appear in my work! I agree with you on being more selective now Andrea. 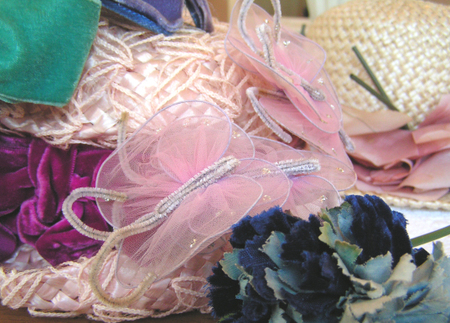 I love to buy old millinery but it is almost impossible to find here! this is so typical of what I am going through right now. June 3 I lost my job and the entire summer I have devoted to cleaning my house -- inside and out. I have so much stuff I can't figure out why I have it. It's sad because if I wouldn't have spent the money on something that was not useful or beautiful I would have money now -- which I don't. I'm at that place, too. Our house is small & with two kids and all our clutter & collections...I want to narrow down & have space. I love fabrics so I have a lot - wish they were vintage, but mostly they are quilting. My problem is that I love everything vintage. I wish I was particular about a color scheme like most of the bloggers - some are only into pastels and some are only into bolder colors...I love all the schemes. I also have a tendency to pick up battered things I can transform into something prettier. It gives me a sense of accomplishment, but I'm outta room and I am not a seller (hmmmm...yet, this must be how that journey starts). So, if I have to be really selective I would have to stick with colorful vintage tableclothes & fabrics...I guess it is a good thing that I can't often find these at prices I can afford. I am pretty selective too! Love the hats...I just picked up a couple myself. Love the old hats...but they have to have certain elements before I jump in...I also love old jewelry...but I am selective there as well. I want my pieces to be special. It's tough to do...there is so much vintage out there right now. Love your hats...the velvets were really velvet back then!